A strong woman will say her goodbye differently as she is not just a woman. She won’t cry for a long time, she won’t blame on your previous mistakes, and she won’t force you to stay either. She is familiar with separation as she is stronger because of it. She will let you leave as she knows exactly that people are temporary and most of the times, life goes on with or without the one she has loved. She will respect your decision to leave because she understands that you deserve to be happy and explore this whole world as long as you possibly can. A strong woman knows that she has to be survived alone and she will never rely on others just because her heart was broken. 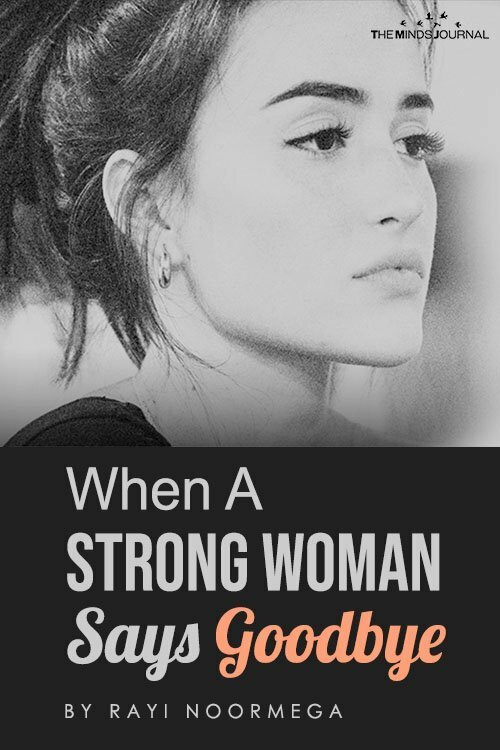 A strong woman will always remember that attention and affection are the things that shouldn’t be asked from other people because love should be simple and easy. She is the kind of woman who truly understands that the right people will always stay and if you decide to leave, she believes that she will meet countless new people along the way. She knows that every ending will always be followed by a new beginning and she is not afraid to start over. This kind of woman is tired of always being left behind and taken for granted, but she will never regret her decision to love you back then. She is fearless and she knows that she will be brave enough to open her heart again, even though she has been hurt for million times. This kind of woman will always keep her hopes alive as she believes that there are some people out there who won’t leave her side whatever happens. Your absence will teach her about her own worth and she will eventually realize that she will always be herself, with or without you. Thus, rather than saying goodbye and mourning her loss of you, she will raise up once again and she will try her best to go through one day at a time. Your absence will be her fuel to pursue her unmet goals and dreams. She will not only survive, she will achieve her dreams. Despite the fact that she is broken beyond repair, she knows exactly that she will grow stronger than before as she always learns from pain and you gave her so many lessons. Rather than saying goodbye and asking you to come back, a strong woman will learn how to forgive herself. She will learn to love herself more than before as she realizes that self-love is the key to make her survive. She will try her best not to blame herself upon your decision to leave. She will try to convince herself that she had done her best to make you stay, yet you’ve left her anyway. One thing for sure; when a strong woman says goodbye, she will never turn back. So, when you come to your senses and realize that you’ve made a wrong decision to leave her, it will be too late as she has already moved on. A strong woman will always keep moving forward as she will never live in her past. You are just a part of her past and she will keep it that way. She might give you a second chance, but she knows exactly that her trust towards you has been broken. Thus, she will forgive you, but she will never forget what you did. When a strong woman says goodbye, that was the exact moment you will realize that she didn’t lose anything; you lost her instead. 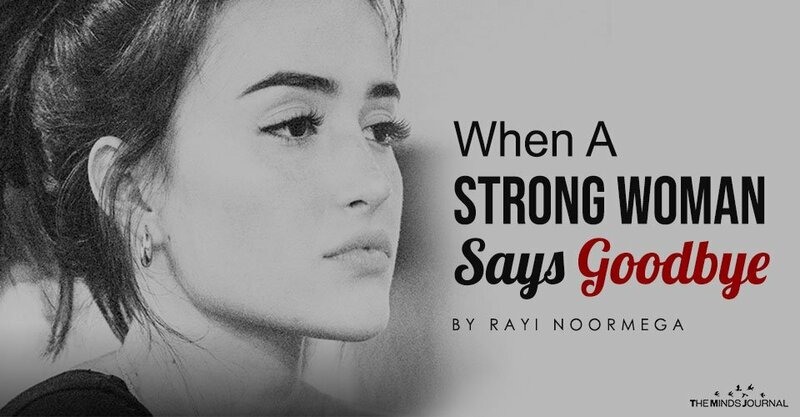 Rayi Noormega is a 22 year-old girl from Indonesia who is currently studying Psychology and just found out that her true passion is actually writing. She's in love with midnight flights, city lights, and those long road trips until the dawn with non-stop deep conversations.